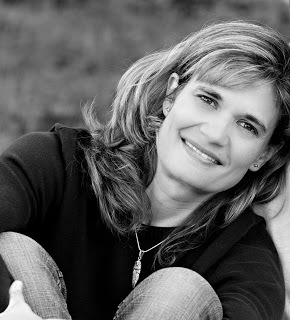 On the blog this week is an exciting interview I conducted with Kimberly Sabatini, debut author of Touching the Surface from Simon Pulse due for release on October 30th, 2012. Get your copy preordered at Amazon or B&N now! You may also add the book on Goodreads. This is one you don't want to miss! 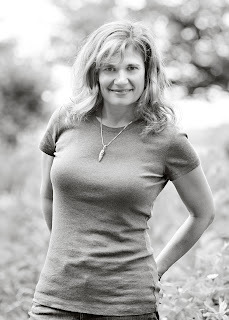 Kim, thank you very much for joining me for this interview and giveaway as we draw closer to your debut novel’s release day on October 30th, 2012. Let’s cozy up with a homemade cup of hot chocolate, some chocolate chocolate zucchini bread, and a warm fireplace. Now that we’ve got the mood set, let’s discuss your first book with my blog viewers and followers. First of all, the cover is GORGEOUS! Touching the Surface is a self-described heart-book, and one that started with a question. Can you walk us through how that journey started for you, and how it grew from a question to a full-blown book? The biggest question at the heart of this book wasn’t completely clear to me until after I’d finished writing it. It began as an unconscious idea that began to surface after the death of my father. He’d died young, at fifty-seven, leaving too many stones unturned. Because his passing sparked my own self-examination and need to grow, it felt weird to me that death would be a free pass to enlightenment—especially when I was left behind to figure out so many of the same things that I knew we both needed to master. Rather than feel alone on this scary, epic journey of becoming a better person, I pictured him in some alternative place, working on the same types of things that I was—growing just like me. I didn’t realize it at the time of writing, but by creating the Obmil, I had built the place that I pictured my dad. As I’ve read up on Touching the Surface, and your next book The Opposite of Gravity, I quickly realized you’re pretty deep when it comes to writing. Can you share about that? Why is depth important to you in a book, and what do you hope will resonate for your readers as a result of that depth? I’ve learned you’re a runner, and I’m intrigued by the way that might parallel your writing journey, and Elliot’s journey (your main character), through Touching the Surface. How has the exercise of running informed the writing of, and essentially the journey Elliot must face at the heart of Touching the Surface? If you haven’t already answered this above, what might Elliot run from? What must she run toward? The only thing we ever really run away from is ourselves and ironically it’s really the same thing we run towards. We try to leave our less than favorite parts behind and if we’re motivated, we go searching to find a better version of who we are. Life is a very circular process—no matter how much we try to straighten it out. I’m a state certified English teacher, so forgive me if I get a little book crazy. I am fascinated with the way many teen books and young adult books allude to famous works of literature. Can you think of an allusion for Touching the Surface, intentional or subconscious? You can also draw comparisons between other YA literature, if that’s easier. Agents often make comparisons when pitching a book to a publisher. Was that the case for Touching the Surface? If so, can you share with us what books yours was compared to? What first drew you to Touching the Surface, the story or the characters? They developed in tandem. That seems to be the way I like to write—characters on one side of the scale and plot on the other side. I can only start writing when they both have enough weight and balance. I’ve alluded to this above, but will there be more to the story after Touching the Surface? If so, can you tell us anything about it (other than the title) such as what direction the story goes? For all intents and purposes—no. There is a possibility of a companion book or two, but there won’t be clear continuation of Elliot’s story. When you get to the end of SURFACE I think you’ll understand why—even though you may want one. What is the POV of Touching the Surface? If you could write more to the story from a different character’s perspective, who would you pick to write about (you may pick more than one) and why? I understand there is a triangle of sorts in Touching the Surface. Sometimes, love triangles are overused or exploited, especially in YA. What makes Touching the Surface different and what can you tell us about these two boys and the excruciating choice Elliot must make between them? Triangles can be over used, but in my opinion they were over used in my own life, very rarely were there only two people involved in any particular drama. *head thunk* In my humble opinion, they are just a form of tension and they can be well written or poorly written. I’m hoping mine hits the mark. Might her choice be apart from both of them entirely? Do you enjoy “torturing” your readers? I hope I’m not being unreasonably hard on you. I’m sure you’ll be able to answer these questions quite well. I’ve read a few of your other interviews. This is a little bit daring to say, but what I’d like you to see is an author who has stayed true to herself. I’d like to see a me who has not lost the passion and purpose for her writing, despite the business and social medial side of publishing. I would like to be writing the books that I need to write, regardless of where that takes me. I want to do this until I’m gone, and I believe that the only way to make that happen is to follow my inner compass. Bonus: would you like to share any ideas for a movie dream cast for Touching the Surface? What about an app or an interactive website/game, etc. could you envision for your stories? Thank you very much for taking the time to answer these questions. I’m honored to share this giveaway with your fans and readers. Kimberly Sabatini is super sweet and ultimately awesome, and not just because she's an author. She is a wonderful human being you should get to know better. You can follow her on her website, her blog, her Facebook, her Twitter, her Goodreads, her Google+, her Tumblr, her LinkedIn, and her Pinterest. Most of all, go get this book and read it and love it. If you enjoy it, please post a review online. Spread the love, people! If you'd like to enter the giveaway, use the Rafflecopter entry form below. Some entries require additional steps, such as going to Kimberly's blog and posting a comment, or submitting a poem, artwork, a vlog or sculpture of something related to Touching the Surface. Failure to complete a step after claiming the points for entering will disqualify you from the giveaway. I would rather not see that happen, so keep it fun and be honest. Good Luck to all who Enter. This giveaway is for US and Canadian residents only. 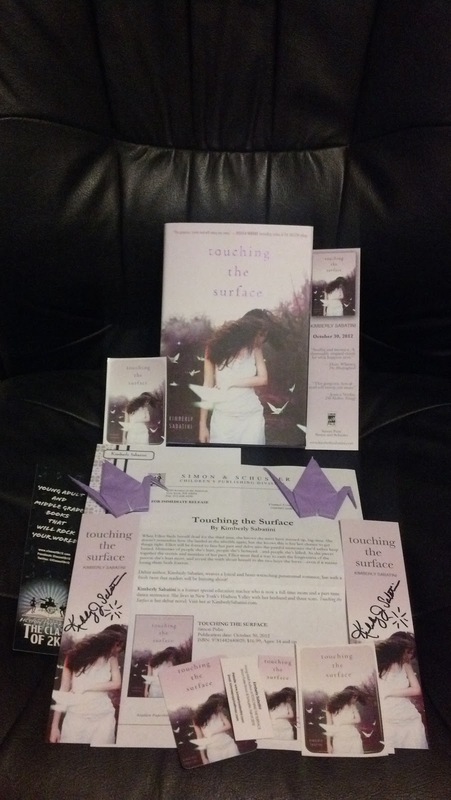 The winner will receive a personalized, signed hardcover copy of Touching the Surface from Kimberly Sabatini herself, who was gracious enough to offer such a deluxe prize for my readers and blog followers. Feel free to acknowledge this below in the comments. By the way, her swag is amazing. So, get to entering already! UPDATE: Winners have been selected and notified. Two of you have submitted poems for the additional 25 point entry, and not only has Kimberly received them, but she described them as "Amazing!" In fact, one of the two ladies is our grand prize winner of the Personalized, Autographed Hardcover Copy of TOUCHING THE SURFACE. This will be sent directly from Kimberly Sabatini herself, and is already in the works. Congratulations to Alyssa! 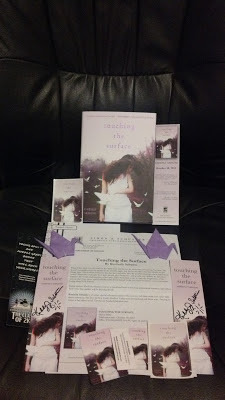 A second surprise prize of a hardcover copy of TOUCHING THE SURFACE with an autographed bookmark will be sent out shortly. Congratulations to Vivien! Finally, a third surprise prize of a signed bookmark of TOUCHING THE SURFACE swag will be sent shortly. Congratulations to Alicia! To the rest of you, a hearty thank you for your entries. I hope you'll get a copy of TOUCHING THE SURFACE and post your reviews online. Thank you so much for your excitement over Kimberly's debut and I know she appreciates each and every one of you for your interest and your kind words. Feel free to chat with her on Twitter or Facebook. Look for the links on this blog post. 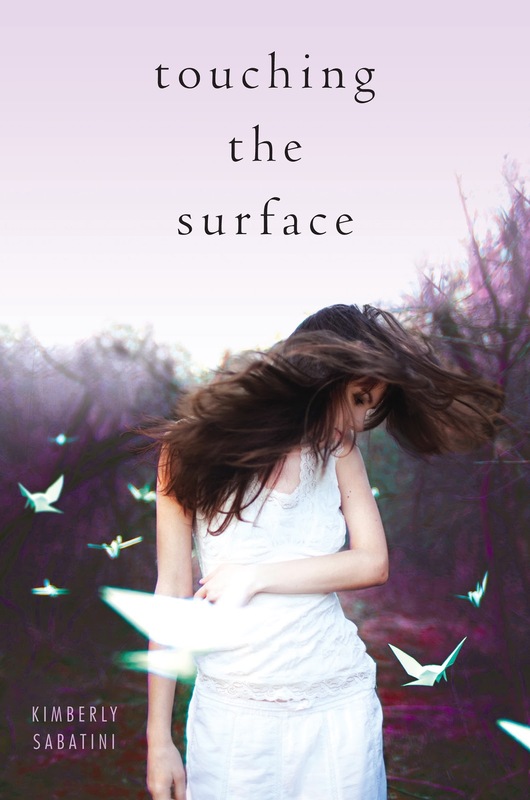 Also, come back soon for a review of TOUCHING THE SURFACE and a giveaway or two in the next month. Little mementos that remind you of them. Be it trinkets you have lying around or photos or gifts that were given to you by them. Keeping the little things around can really help out. A positive way to keep the memories of a deceased love one alive is to just live in the joy that you had with them, knowing they are still very much a part of your life even though they are "gone". I share stories with my daughter all the time about my sister who passed away 8 years ago. It is through the memories I share with my daughter that allows the memories to stay alive. First, Kim and I both attend the Pocono Retreat. She's a sweet person, and I'm very happy for her. As for your question, I think writing about loved ones is a great way to remember them. Great interview! It is both informational and inspiring! I can't wait to get back to the current project I'm working on! Also I already added "Touching the Surface" to my TBR list on goodreads. I also do some of my best thinking while running. It's nice to learn that I'm not the only one. I have commented on the parallels between running and writing on my blog in the past. A positive way? I guess that keeping them always in your mind and remembering all those nice moments you spent with them it's a great way. Sounds like a great book. This was a really nice interview. Thanks for sharing! It is a great book. I'm reading it now. Wondering what will happen in the afterlife. This is a completely fresh take on life and death and everything in between. just keep remembering all the good memories, photos, and momentos that remind you of them.